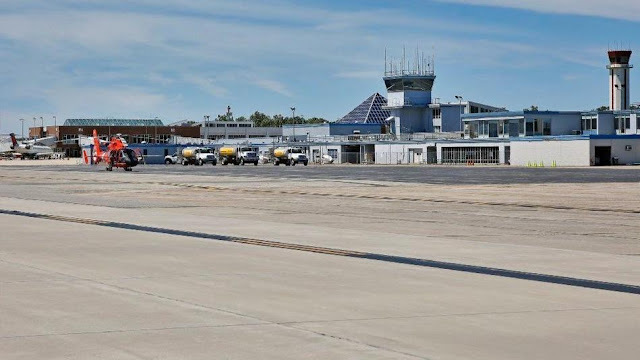 A changing market and a new sales pitch are sparking airline interest in Newport News/Williamsburg International Airport, executive director Michael Giardino said after an invitation earlier this month to talk to a large, western U.S. regional carrier. But that market change makes some of the airport’s past efforts to woo air service simply unrealistic, he told the Peninsula Airport Commission this week. That means the discount carrier that airport officials had so long hoped would lure travelers from Richmond and South Hampton Roads probably isn’t in the cards. Neither, Giardino said, is a direct connection to New York. In recent months, for instance, discount airlines have started or announced new services from Norfolk or Richmond to Nashville, Denver, Orlando, Sarasota, Cleveland and Cincinnati. So these days, Giardino and his staff focus on boosting service from Newport News to hub airports. Their pitch is simple, and has two basic parts. First, a new study shows more than 4,000 Peninsula residents a day are driving to other airports to catch flights. Second, the Peninsula’s strong and growing corporations generate a lot of business travel. Giardino said the airport in Rochester, N.Y., where he used to work, has boosted flights by 10 percent despite a sliding economy. So he said the Peninsula, with a shipyard that’s hiring and an economy powered by long-term government contracts, ought to be able to attract airlines. That pitch won him a coveted invitation to that western U.S. carrier’s headquarters earlier this month. It’s one of several airline headquarters he’s been invited to in recent months, as airlines take a fresh look at Newport News. That carrier — Giardino didn’t want to name it — operates more than 400 aircraft, and has built a more than 2,000 flights-a-day business in large part by running connecting services for three of the Big Four airlines. At the same time, Giardino and his staff are pressing two of the Big Four, American and Delta, which already link Newport News to Atlanta, Charlotte and Philadelphia, to expand services and maybe add other hubs. He’s been chasing United for connection to its hubs — “I’ll even talk to Southwest Airlines,” though it killed off Newport News’ connections to New York and Boston after it acquired AirTran in 2011, he said. Giardino is meeting monthly with Elite Airways, which had hoped to operate a Newport News to New York service. Elite canceled those plans out of concern that business would be hurt by controversy over the former airport administration’s use of public money to pay off debts of a failed start-up company, People Express. Elite proposed flights to Myrtle Beach last year, but never attracted enough interest to begin the service. The airport’s other big sales effort is local, tackling the impression that it costs more to fly from Newport News than other airports, marketing director Jessica Wharton said. “We’re saying: ‘Check us first,’ ” she said, adding that fares out of Newport News are often lower than other nearby airports. In fact, Giardino said the one time he’s paid more to fly from Newport News was to make that flight this month to pitch that western carrier.